– “Boston, Bloody Boston.” : The controversies and conflicts leading to war, including the Stamp Act, the Boston Massacre, the Boston Tea Party, and the Battles of Lexington and Concord. – “Rebellion to Revolution.” : The Revolutionaries lay siege to Boston; the formation of the Continental Army and the conscription of slaves by both sides. – “Declaring Independence.” : Dark and devastating struggles challenge the dreams for independence in 1776. – “American Crisis.” : General George Washington gambles on a brilliant yet dangerously daring stroke to save his army and America. – “Path to World War.” :Benjamin Franklin tries to convince the French to join the fight against Britain; Philadelphia falls to the British; the Americans win a stunning victory at Saratoga and gain a new ally. – “Forging an Army.” : Washington struggles to sustain and rebuild his Army at Valley Forge. – “Treason & Betrayal.” : General Benedict Arnold betrays the revolution. – “The War Heads South.” : The British lay siege to Charleston. – “Hornet’s Nest.” : War erupts in the Southern Colonies. – “The End Game.” : The struggle for independence reaches its climax as both sides are tired of the war. – “Road to the Presidency.” : The War is over, but Washington is enlisted for another duty. 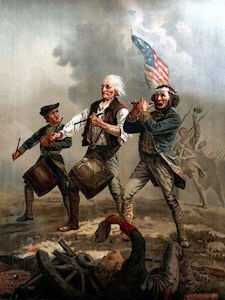 – “A President and His Revolution.” : While Washington is on his way to be inaugurated as the first US president, he looks back at some defining moments in the revolution. The History Channel and A&E Home Video released a four disc DVD set on December 19, 2006, following its series debut on the History Channel. Another documentary series with the same name was produced by (and aired on) A&E in 1994. This earlier series consisted of six episodes and was hosted and narrated by Bill Kurtis. 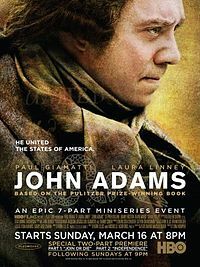 Voice-overs included William Daniels as John Adams, Charles Durning as Benjamin Franklin, Kelsey Grammer as Benedict Arnold, Cliff Robertson as George Washington and David Warner as King George III.